The theme over at The Shabby Tea Room this week is 'Soft Neutrals' check out the Blog for some amazing cards from the Shabby Girl Designers - you won't be disappointed. For my entry I've made flowers using some Maya Road Kraft Doilies and scallop circles of Core'dinations Distress Cardstock. Then stitched stems with top stitch thread for added texture. 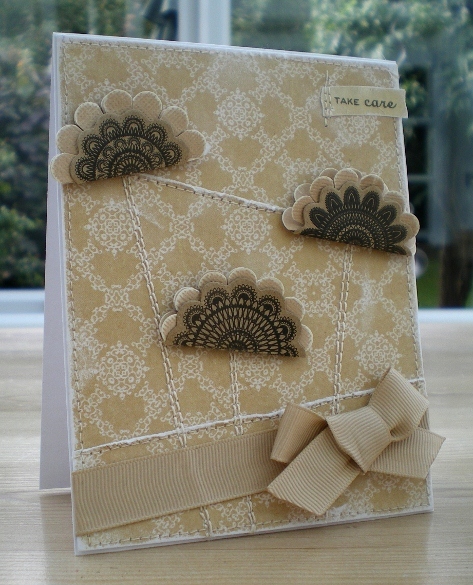 Absolutely beautiful Vicky, love the neutral colours on this card...and once again, your stitching looks fab! Oh this is gorgeous hun...just love it!! Beautiful card, and I really like the stitching! Lovely card Vicky... love all those neutrals and that fab stitching! I've been missing all your wonderful makes Vicky - love your cards with the stitching - and the owl bookmarks look wonderful!